Price2Spy is a cloud-based price monitoring platform that delivers real-time price-related information of your competitors when you need it. With Price2Spy, you know what your competitor sites are offering for what price. You can specify which sites you want to track and choose particular products or services to follow for a more thorough monitoring. You may also receive notifications of price changes via email alerts or go deep into past pricing history to analyze patterns and discover trends that may lead to highly actionable insights. Being able to see the prices of your close competitors and compare them side by side, making quick and decisive pricing decisions is going to be a breeze. Price2Spy is a powerful price monitoring solution that comes loaded with lots of features and capabilities. On top of that, it is an intuitive, user-friendly cloud-based software that doesn’t require you to purchase or install any software or maintain any server, making it a lightweight business platform with a punch. With Price2Spy, you are able to monitor your competition’s online stores and websites and track specific products and services and their pricing. All you have to do is enter the product URLs into the Price2Spy system and the software will automatically check the price for you and alert you in real time whenever there are changes in the pricing as well as the availability of their product. With pricing information of your competitors readily available to you, you are able to make quick actions and decisions with your own pricing. Price2Spy gives you a huge advantage over the competition, allowing you to make different price comparisons so you can set your own price where you and your customers both win. 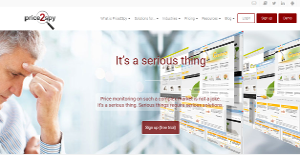 Unlike many other similar price monitoring systems and software, Price2Spy is capable of monitoring websites that are built to shield off monitoring applications. You can virtually see the pricing of your competition even if their websites don’t want to be monitored. If you are dealing with multiple currencies or you want to check prices in the international market, Price2Spy can monitor prices in various currencies. This functionality is quite useful for businesses with an international reach. What Problems Will Price2Spy Solve? Scenario #1: A leading internet store in the Netherlands wanted to monitor a specific category of products to be monitored – professional tools with the unique serial numbers. The company also planned to focus on about 100 products and track around 20 competitors. Price2Spy enabled them to match products based on their serial numbers and closely monitor the competition. Scenario #2:Another Scandinavian gardening equipment manufacturer needed to enforce strict MAP (minimal advertised price) policy on retail sites worldwide. This client experienced problems with retailers who were not complying to MAP, thus damaging the client’s general brand value. With Price2Spy, the company was able to monitor the pricing of several dozens of their retailers worldwide – in order to ensure that they comply to MAP policy defined by the client. This saved them at least eight hours of manual work per week. If you are considering Price2Spy it might also be sensible to check out other subcategories of Best Business Intelligence Software listed in our base of SaaS software reviews. Since each company has unique business needs, it is sensible for them to abstain from seeking a one-size-fits-all faultless software system. Needless to say, it would be pointless to try to find such a platform even among popular software platforms. The clever thing to do would be to list the various important aspects that require consideration such as key features, finances, skill levels of staff members, company size etc. Then, you should do your homework thoroughly. Read some Price2Spy reviews and investigate each of the other solutions in your shortlist in detail. Such in-depth groundwork can ensure you weed out ill-fitting applications and select the solution that offers all the features you need for business success. How Much Does Price2Spy Cost? We realize that when you make a decision to buy Business Intelligence Software it’s important not only to see how experts evaluate it in their reviews, but also to find out if the real people and companies that buy it are actually satisfied with the product. That’s why we’ve created our behavior-based Customer Satisfaction Algorithm™ that gathers customer reviews, comments and Price2Spy reviews across a wide range of social media sites. The data is then presented in an easy to digest form showing how many people had positive and negative experience with Price2Spy. With that information at hand you should be equipped to make an informed buying decision that you won’t regret. What are Price2Spy pricing details? What integrations are available for Price2Spy? If you need more information about Price2Spy or you simply have a question let us know what you need and we’ll forward your request directly to the vendor.